Tenori-on Orange: available in a matter of weeks. Yamaha's Tenori-on has a habit of impressing pretty much everyone who plays it, but the brutal truth is that not everyone can afford (or is prepared to pay) in excess of £800 to own one. The good news, then, is that Yamaha is readying a more affordable version - the Tenori-on Orange - and, wouldn't you know it, it'll be here in time for Christmas. "We know everyone loves the concept and fresh approach of Tenori-on, however, as you'd expect we have received thousands of requests for a more affordable version," explains Yamaha's Peter Peck. "We therefore looked at many ways of reducing the price without compromising the all-important product concept or creative operating system. 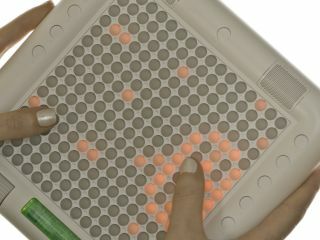 By removing the battery option and the back panel LEDs and changing the chassis construction from the magnesium found on the original to a more affordable material we have achieved our goal of creating the more affordable Tenori-on Orange, bringing the full creative capability of Tenori-on to a much wider audience." Yamaha says that the Tenori-on Orange will start shipping in December at an as yet undisclosed price, but we've already seen it listed for £649. The company has also revealed that it's releasing a firmware update for the original Tenori-on - this will be available from January 2010. We're told that this will address a number of areas, including syncing of the Tenori-on to DAWs and also the MIDI sync implementation. Visit the official Yamaha website for more info on the Tenori-on Orange.